Google has turned the boys in blue red with rage by refusing to hand over private data except by court order. Police want to trace a vehicle snapped by Google's Street View cameras next to a caravan that was stolen shortly afterwards. The thief struck in June 2009, while the Soanes family, from Linton, Derbyshire, were out. 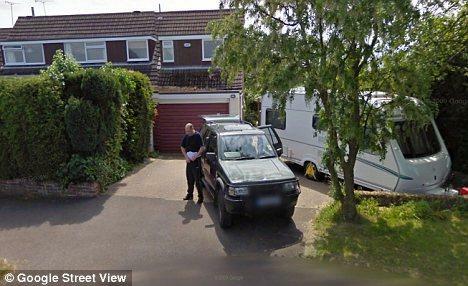 The police investigation stalled until March 2010, when 11-year-old Reuben found the family home on Street View and saw and the unidentified 4x4 and its driver had been captured on the driveway. A public appeal for information was issued in November, using the the publicly available version of the photograph, in which the number plate of the 4x4 is automatically blurred by Google to comply with privacy laws. At the same time police asked for the non-anonymised version, but were rebuffed. It apparently drew no leads, and now Derbyshire Police are pressing Google to release the image without the inconvenience of obtaining a court order. Investigators have roped in local Tory MP Heather Wheeler to put pressure on the search giant to bend its rules. "I am disappointed that Google's initial reaction is to refuse," she told the Derby Telegraph . "It would be sensible for them to enter into a protocol with British police forces to receive and acquiesce to police requests. Of course, the police can get a court order but what a waste of public money in order to do that." "It's very important to Google and our users that we only provide information if valid process is followed, as laid down by governments in law," it said in a statement. "We have a team specifically trained to evaluate and respond to requests when they are received, and we will of course co-operate with police requests as long as they are legally valid and follow the correct processes." The rules on when authorities require court backing to obtain private data vary. Most notably for a company such as Google, under the Regulation of Investigatory Powers Act, intelligence agencies and police can obtain communications data – records of who communicated with whom, when, where and how, but not of what was said – without routine outside scrutiny.